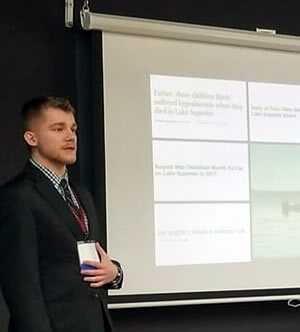 Five student teams from Michigan Technological University traveled to Central Michigan University (CMU) in Mount Pleasant, MI to compete in the ninth annual New Venture Competition held Friday, April 12, 2019. Cameron Philo won Best Technology Venture for Life Pro Jackets and was awarded $10,000. Philo participated in Michigan Tech’s I-Corps Site Program last Fall. I-Corps is a team-based program structure that was developed through a partnership between the National Science Foundation (NSF) and Silicon Valley entrepreneurs. SPIE is the international society for optics and photonics. Details of Middlebrook’s presentation are available online. The first Electrical and Computer Engineering department texting campaign was held on March 26, 2019. The texting campaign is similar to the calling campaign the department put on earlier in the semester; however, students were able to send in questions via text. 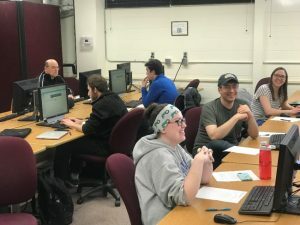 Five current Tech students held conversations with approximately thirty students who had been accepted to Michigan Tech, answering questions all across the board. The event was a success, and our students had a great time answering questions and discussing their experiences as a Husky—which can clearly be seen by the smiles. By Kelsey Robinson, EE senior. 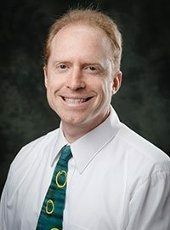 Timothy Havens (ECE) is the principal investigator on a research and development project that has received $96,643 from the Naval Surface Warfare Center. This is the first year of a potential three-year project totaling $299,533. Students working on soldering, with Blue Marble Security members assisting with questions. Engineers’ Week this year took place February 17 – 23, 2019. Michigan Technological University’s nationally recognized engineering honor society, Tau Beta Pi (TBP), partnered with Blue Marble Security Enterprise to participate in a Heart Rate Monitor (HRM) Event. The event was held on Friday, February 22, where approximately 15 TBP members learned the basics of soldering. The TBP members had various levels of soldering knowledge, some being beginners and others having plenty of experience. They represented various majors while participating. The Blue Marble Security outreach team supervised for those with little experience and answered questions. The HRM is a basic circuit used to teach students how to read color bands on resistors. The colors correspond to the resistor ohm value and polarity regarding the device LEDs. Besides basic component knowledge, the students learned the correct and safe process of through hole soldering. Upon the completion of populating and soldering the components in place, students were given an integrated circuit and nine volt battery to check the operation of the board. The TBP members took their completed heart rate monitor boards home as souvenirs of their soldering experiences and of Engineers’ Week 2019. 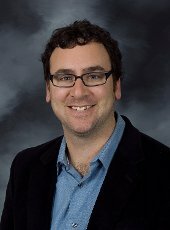 Joshua Pearce (MSE/ECE/IMP) is the principal investigator on a project that has received a $20,000 research and development contract from Sandia National Laboratories. This is a 10 month project totaling $40,000. 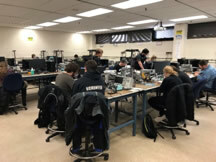 Michigan Tech’s new course in printed circuit board (PCB) manufacturing is the topic of a series of columns in I-Connect 007. The first column “Better to Light a Candle” Chapter One—Prepping the Next Generation,” by Marc Carter, features an interview with Christopher Middlebrook (ECE). 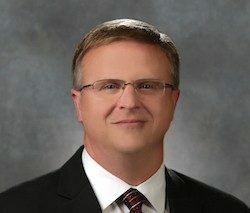 Editor’s Note: This is the first in a series of columns on a new university course in PCB manufacturing at Michigan Technological University. Marc will chronicle the progress of this class, interview the guest lecturers, introduce the students, etc. That is why it was so refreshing to learn of someone who has decided to do something about it. 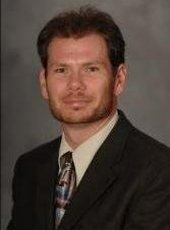 Enter Dr. Christopher Middlebrook, a professor at Michigan Technological University (MTU) in Houghton, Michigan. On January 14, 2019, he will open the first session of “EE4800: Printed Circuit Board Fabrication”—a hands-on engineering class intended to give undergraduate students an introduction to the basics of printed circuit design, fabrication, and assembly. Read more at I-Connect 007, by Marc Carter. In subsequent columns, Carter will chronicle the progress of the class, interview guest lecturers and talk to students. In addition to photos of Michigan Tech’s equipment suite for the new course, Carter interviewed instructor Chris Middlebrook (ECE). In the interview section of the column, Middlebrook tells Carter he is amazed by the response and guidance from industry in launching the new course. I-Connect007 is a extensive global source for news and original content serving the printed circuit design, fabrication and assembly/EMS market. Michigan Tech has entered into an agreement with Altium for the use of software in a classroom setting. The 12-month arrangement allows the University the use of Altium Designer software used to design printed circuit boards (PCBs). The software will be primarily used in EE4800, Printed Circuit Board Fabrication, taught by Christopher Middlebrook (ECE). The agreement includes 20 licenses to the latest version of the Altium Designer software, as well as free updates and upgrades. Middlebrook says he is pleased with the agreement, valued at $116,850. “Using Altium will allow students to have first-hand experience and exposure with a globally recognized software design package,” he said. EE4800 is a hands-on undergraduate engineering class that teaches students the basics of printed circuit design, fabrication and assembly. This is a new course with its first offering in Spring of 2019. The class is the subject of what is expected to be a series of columns in I-Connect007. Altium is a multinational software corporation headquartered in San Diego that focuses on electronics design systems for 3D PCB design and embedded system development. By Electrical and Computer Engineering. 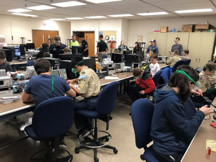 Blue Marble Security Enterprise assisted the local Boy Scouts on Tuesday November 27th, 2018, as they participated in a heart rate monitor soldering event. The event is used to teach the basics of electrical engineering components in an interactive and effective manner. 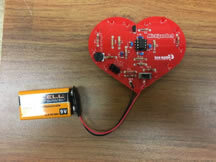 The heart rate monitor, once soldered with correct connections, will cause the LEDs to light and with the use of the sensor the LEDs will blink with the operator’s heart rate. 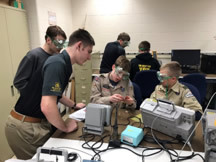 Around seventeen boy scouts ranging in the middle school age participated in the event with seven Blue Marble Security members as well as their advisor who monitored and assisted in the lab. The focus of the heart rate monitor lab is to introduce the basic concepts of electric engineering to those with little experience. Some of the concepts learned are how the color bands on resistors correspond to the resistor’s value, the polarity of diodes, and why it is important to place them correctly. However, the focus of the lab was to make effective through hole soldering connections. Scouts who were unsure about the process got a quick demo from an Outreach team member. All the members got portions of their boards populated with components within the time limit, with a few getting the boards completed and tested. All the boy scouts will get to take a heart rate monitor board home after the Outreach members troubleshoot and finish up some of the boards. The boy scouts had a wonderful time, and learned a new valuable skill. Michael, John, and Shawn BMS members answering various questions the scouts have. 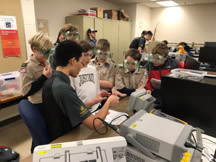 Overview of the lab with the scouts working on their heart rate monitor soldering boards. The completed heart rate monitor board SWE members took as a souvenir. On Friday November 9th, 2018 Blue Marble Security hosted a heart rate monitor soldering lab for the Society of Women Engineers (SWE). The heart rate monitor, once fully soldered with correct connections, would allow the LEDs around the edge to blink with the operator’s heart rate. Sixteen SWE members were present along with six Blue Marble Security members to monitor and assist in the lab. Students working on the heart rate monitor boards with BMS members supervising. The focus of the heart rate monitor lab is to introduce basic concepts of electrical engineering to those with little or no knowledge. The SWE members specifically learned how the color bands on resistors correspond to the resistor’s value, as well as the polarity of a diode and why it is present. 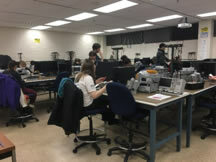 The main focus of the lab was to teach the SWE members to through hole solder appropriately so that there would be strong connections on the board for current to flow. All of the SWE members completed the lab within the time allowed. Each took a heart rate monitor board as a souvenir to remember their new skill. Michigan Tech has received a $75,000 gift from ITC Holdings Corp. to support the renovation of the ECE Learning Center in the Department of Electrical and Computer Engineering. The renovated space will provide a clean, well-equipped place for undergraduate students in electrical engineering and computer engineering to study together and participate in peer mentoring with learning center coaches. The ECE Learning Center is housed in 123 EERC, a room of 560 sq. ft. adjacent to the ECE department office and near two large lecture halls. It is used for student collaboration, peer mentoring and as a place for students to work on homework and socialize between classes and in the evenings. The proposed renovation will bring the room up to modern technological standards as a collaborative and mentoring workspace. There will be an overall facelift with new carpeting, painting and glass whiteboards, and the space will be redesigned around sets of tables and chairs with pods that allow students to connect laptop computers to one of three 65’’ wall-mounted monitors. It is anticipated that the enhanced functionality and attractiveness of the space will lead to increased utilization and a greater sense of community among ECE students. In recognition of ITC’s support for the ECE Department over many years, and for this gift specifically, the ECE Learning Center will be renamed the ITC Learning Center for at least the next five years, and will be recognized as such with appropriate signage and displays. By the Department of Electrical and Computer Engineering.